4 Bedroom Detached House For Sale in Helston for Guide Price £795,000. Parc Brawse is a prominent and striking detached 5/6 bedroom property set within its grounds boldly facing toward the sea. This property has evolved from a former 17th century cottage with an addition of the larger Victorian extension which now creates flexible accommodation. The property has recently undergone refurbishment and presented to high standards. The cottage side of the property has the potential to use as an annex for family, guest or even a fabulous holiday let. From the gravelled driveway you enter into an elegant hall with high ceilings, exposed timber flooring and the most striking hand crafted spindle staircase, flooded in sunlight from the tall picture window. To one side of the hall is the elegant sitting room with large windows, timber flooring, central feature fire place which completes this perfect family room. Across the hall is the bright and inviting library arranged with book shelves almost to the ceiling. The fire place and timber flooring adds charm to the room. The double aspect windows have views across to the lighthouse and the sea beyond. The following room is the spacious kitchen fitted to a contemporary design including a centre island. The slate flooring, rangemaster oven plus a Rayburn range add the finishing touch. An open doorway takes you through to the cottage or annex side of the property. This has the potential to be a kitchen, currently used as a breakfast room plus the advantage of a separate entrance door. From this room an inner hall leads past a larder storage room, to a cosy character sitting room, large wc and onto two large double bedrooms, both having a modern and stylish en-suite with walk-in shower. Staying on the ground floor centrally positioned within the property is a spacious character formal dining room with a feature fire place. This is the perfect room for entertaining guest or the family. From the dining room there is a superb addition part of a latter extension which includes a study/studio looking out to the garden and a separate utility room with plenty of space for washing machine and storage. The turning staircase rises to the grand open gallery style landing which gives access to the three bedrooms and family bathroom. Starting with the spectacular master bedroom, having a seating are at one end having a triple aspect with views towards the sea. The exposed central brick fireplace gives the room plenty of character. Adjacent to the master room is the dressing room fitted with a range of wardrobes, drawers and storage perfect for the lady of the house! Next is a lovely bright double bedroom with double aspect large windows overlooking the gardens. Now to the stunning extra large family bathroom fitted to a high quality to include a central oval claw foot bath, large glass walk-in shower, matching wc and wash hand basin and to finish the room a feature fire place. Moving through the first floor takes you to the third double bedroom again with views towards the sea views. This room is perfect for guests as it has the advantage of being next to another superb bathroom tastefully decorated with an oval bath and further glass walk-in shower. The gardens are arranged to three sides of the property with a large gated gravel parking area for several cars. To the front of the property is a garden area with lawns and hedging which would make a separate garden for the cottage if required. To the opposite side of the property is the larger garden with a gravelled seating area and lawn arranged with variety of flower beds, shrubs, pond, vegetable area a green house, and potting shed plus larger wooden shed with garage potential. There is also a spacious patio area ideal for barbeques. Another feature to the garden is a secluded decking area home to the hot tub! 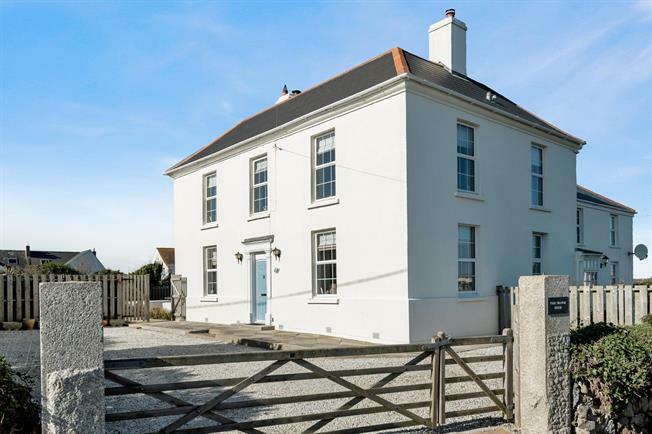 The property is positioned within the Lizard Peninsula, the most southerly point of mainland Britain. Jutting out into the sea where the Atlantic Ocean meets the English Channel, plus designated an Area of Outstanding Natural Beauty, The Lizard is home to some of Cornwall's magnificent sandy beaches, towering cliffs, an array of wildlife and pretty fishing villages boasting some of the most scenic and dramatic coastline in the country. Lizard Village itself has a vibrant community spirit providing a range of local shops, pubs, activities, church and primary school. Including of course stunning coastal walks. The larger town of Helston, some 12 miles distant offers a larger variety of amenities, schools and supermarkets. Lizard Point, with its focal lighthouse is a short walk, while the coastal footpath can be followed to the east or west. Follow the path passing the lighthouse it makes it way along the cliffs towards the popular fishing village of Cadgwith. Taking the westward path to Kynance Cove there are splendid views over Mounts Bay towards Lands End. Further along you will discover Mullion and Gunwalloe both having exceptional views.